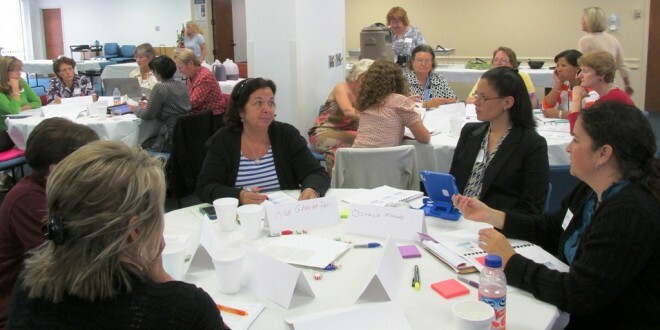 Nurses and other health care industry members take part in a recent regional QSEN Training Workshop organized by JU's Dr. Teri Chenot and Prof. Roberta Christopher. The first Florida summit to address how nurses can improve patient safety comes to Jacksonville University’s Brooks Rehabilitation College of Healthcare Sciences Friday, March 4, with top experts discussing topics such as how to decrease bullying in the workplace and improve attitudes of new nurses. 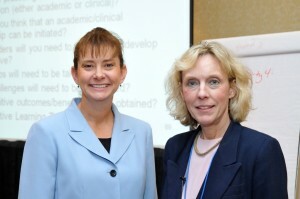 Nearly 200 nurses and nursing leaders, educators and students are expected to attend the free 2016 QSEN (Quality and Safety Education for Nurses) Summit, which is an outgrowth of the Florida QSEN Center created by JU School of Nursing faculty members Dr. Teri Chenot and Prof. Roberta Christopher. A 2014 study from Policy, Politics & Nursing Practice revealed an alarming statistic: Almost one in five newly licensed registered nurses leave their job within the first year, and one in three leave within two years. Poor work environment, incivility, bullying and lack of mentorship have been shown to be conributing factors. The all-day conference at JU is designed to advance the nursing profession so that all Floridians have access to safe, high-quality healthcare. It’s also a chance to network and learn more about QSEN and academic/clinical partnerships. Registration is free for nurses and nursing students, and all eligible will receive four contact hours for participation. Leading up to the summit, Dr. Chenot and Prof. Christopher have brought their QSEN Training Workshops to locations across Florida. To date, 136 nurses have attended, and have been invited to participate in the 2016 QSEN Summit. The regional workshops and statewide summit are made possible by a three-year, $44,883 grant from the Florida Blue Foundation in partnership with the Florida Action Coalition (FL-AC). All presentations from the summit will be available on the Florida QSEN Center website at http://qsen.org/faculty-resources/practice/state-qsen-initiatives/florida-2/.